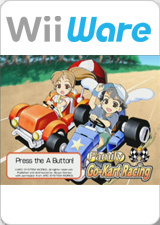 It’s Family Go-Kart Racing, the fantastic new racing game from Arc System Works! The Family is back: Billy, Sarah, Daddy, Mommy, and new to the Family fun, Auntie and Gramps! Choose among the six family members and six karts to take on twelve exciting tracks and drift your way to victory! Tilt the Wii Remote controller to race against the clock in Time Attack to beat your personal records, or take on the entire family in a full Grand Prix! Steer your way through the Snowy Slopes, peel out in the World Bazaar, and go-go-go for gold on the Go-Go Rollercoaster! Earn your place as the head of the family by out-maneuvering your kin with special items like Acceleration and Lighting to zip past your opponents! Or, unleash the Bowling Bomb and strike out the kart ahead of you! The graph below charts the compatibility with Family Go-Kart Racing since Dolphin's 2.0 release, listing revisions only where a compatibility change occurred. This page was last edited on 16 January 2018, at 06:12.